Please join us to meet our state legislators and discuss current issues and League-supported bills. The meeting will be held Friday, March 22 at 9:30 a.m. (light breakfast at 9:15) in the Needham Public Library. Come be a part of the discussion! Our speakers will be Representative Denise Garlick and Senator Becca Rausch (precincts A, B, C, I, J). 2019 Civics BeeRegister a team or an individual for the 2019 Civics Bee!Download the flyer. 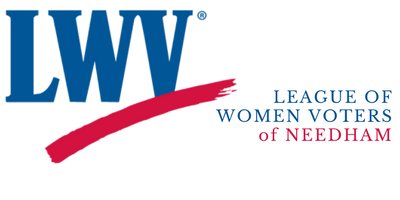 Check back for the LWV-Needham Voters Guide for town offices and Town Meeting Members.